With gale force gusts forecast for the afternoon of Easter Saturday, one long race on a round the cans course in the central/eastern Solent was held today at the Royal Ocean Racing Club’s Easter Challenge. Despite this, there were leader changes in two of the four classes. In the FAST40+ class, Peter Morton on his Carkeek 40 Mk3 Girls on Film won to topple Texan William Coates’ Ker 43 Otra Vez. Girls on Film spent today match racing Sir Keith Mills’ Ker 40+ Invictus. Mills made the best of the reaching start, but subsequently overhauled him. Unusually, in all three other classes there is a boat that has won three of the four races. Holding the largest lead of all is RORC Admiral Andrew McIrvine on La Réponse, now six points clear of Irishman Conor Phelan’s Ker 37 Jump Juice in IRC Two. McIrvine’s First 40 has been constantly beating higher rated boats and spent today match racing fellow former Commodore Mike Greville on the Ker 39 Erivale. Also up with the big boys was the J/111 Jitterbug of Cornel Riklin until she too took a tumble, leaving Erivale and La Réponse to slog it out. Ultimately Erivale won by a boatlength on the water, losing to La Réponse on corrected. McIrvine, who is gunning for British team selection for this summer’s Brewin Dolphin Commodores’ Cup, attributes his success to two training sessions he’s already completed this season and to the strength and experience of his new crew, many of whom raced together on Neil Kipling's J/122, Joopster. Elsewhere Tom Kneen’s JPK 10.80 Sunrise is clinging onto first in IRC Three. Despite David Franks’ smaller JPK 10.10 Strait Dealer having scored bullets in the last three races, he remains one point behind. The closest competition remains in IRC Four where Harry Heijst’s 1972 vintage S&S 44 Winsome won today’s race to take the lead, a mere half point ahead of Sam Laidlaw’s Quarter Tonner Aguila. “It was fantastic to get a race in,” reported Laura Dillon, the Irish helmswoman among Winsome’s otherwise Dutch crew. 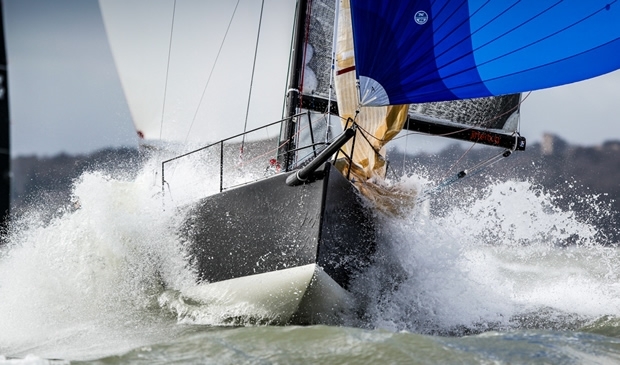 “We were pleased with the heavy conditions - 18 knots, gusting up to about 26 knots. It was a good long race course and for a boat like ours it was beneficial to have some long beats. Certainly with some spectacular broaches and wipe-outs this morning, Jim Saltonstall, RORC CEO Eddie Warden Owen and North U Regatta Service's Andreas Josenhans and Chuck Allen, had no shortage of material to work with at this afternoon’s standing room only post-race debrief at the RORC Cowes clubhouse.